Two things ad agencies are good at: being creative and being competitive, so it’s not surprising that a Post-it war erupted on Canal Street. Two little letters got this whole thing started when someone posted the word “Hi!” in their window. 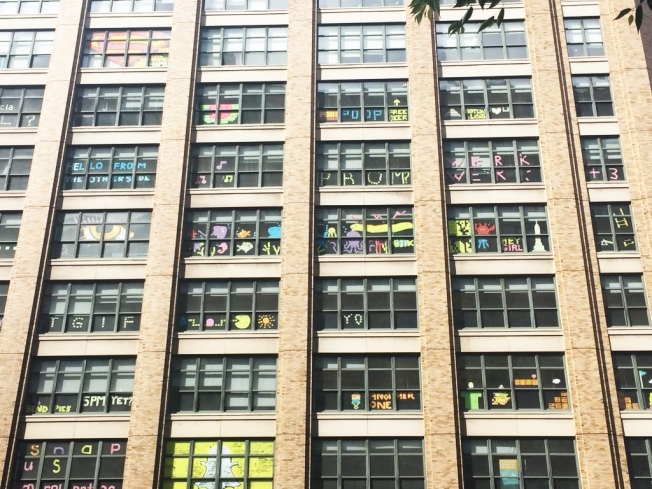 Not even a week later the windows of Havas Worldwide, Horizon Media, Cake Group, and other agencies on Canal street were plastered with Post-its. Talk about repurposing office supplies. Instead of writing annoying notes to co-workers, these admen and women created art. What seemed like good fun to most wasn’t appreciated by the landlord of Horizon Media. They asked for the Post-its to be removed within two weeks. Apparently they don’t like their windows looking like your mom’s refrigerator when you were growing up. This wouldn’t be an advertising story without some good, old fashioned product placement would it? As the agencies traded barbs on small, sticky squares, both 3M and Staples sent supplies to keep the agencies stocked. Havas thought they ended the competition by “dropping the mic” on their counterparts. The giant hand and microphone took about 4 hours to finish and made use of all the window space of their building. But as the saying goes, “It isn’t over until the fat lady sings.” Getty Images and New York magazine made sure of that. Their 2+ story opera singer was the perfect way to initiate a truce and make sure that no one missed out on their Memorial Day BBQ over the long weekend. It’s nice to see that the agency world still enjoys acting like children from time-to-time. Or maybe it’s all the time? I wonder if clients were still getting billed while everyone was getting their arts and crafts on. The best part of the story is that there’s a charity tie-in. Before everyone gets up in arms about the waste of paper, thank-you messages to veterans will be written on the Post-its and turned into a collage that’ll be hung in the VA NY Harbor Healthcare System hospital lobby. To follow along with the brilliant nonsense and see some artwork that will make your preschooler jealous, search the #canalnotes and #postitwars hashtags on twitter and instagram.